Oh boy… I had quite a day yesterday. I had my 36 week check up and the Dr checked for dilation. After groping my tonsils for a few seconds, she said “Yeah, no dilation.” And I am pretty sure my face just went all weird because she started immediately trying to make me feel better. “You could go into labor today or it could be a few weeks!” Oh please. I could go into labor today – That’s a real laugh! I was so surprised that I had no dilation. Contractions have been waking me up at night several times a night for at least a week now. I have so much stabbing pain down there that I feel like I am getting a hundred pap smears a day – from the inside out…. It was very disappointing. And yet, realistically I know that even if I had been dilated it still wouldn’t mean diddly squat since women walk around all the time dilated for weeks. But it still would have been nice. Especially since the Drs have my due date as March 26th even though I believe it is March 28th so they have a cut off that is closer than mine for when they want to talk c section and granted it is only 2 days difference but right now 2 days could mean all the difference. The Dr I saw yesterday said that their practice does not strip membranes. She didn’t say why but I thought that was interesting. The good news is that my exam showed I have started to efface (the ultrasound tech last week measured my cervix just for the heck of it and it was around 2cm long – I don’t know how that translates in terms of effacement but it’s interesting to note anyways) and the cervix is very soft but still pretty high although anterior so that’s good. I am trying to remind myself that things can change quickly and dilation isn’t everything but at this point it is pretty super important if we are going to vbac so… get on it cervix! I started drinking raspberry leaf tea since it is said to help tone the uterus and shorten labor. After I drank it last night I went to bed and had only maybe 3 contractions and have had hardly any today compared to normal. (The tea does not stimulate contractions, it only tones the uterus.) The upside to not having contractions all night was that I didn’t wake up in pain over and over for no reason. 🙂 I also have been rethinking breast pumping starting at 37 weeks. I know my Dr said it is fine after 37 weeks but I have read that it can cause dangerously strong contractions. However, from what I read on Dr Google, this is more likely to happen if you are pumping for HOURS. (Can you imagine? Who would pump for hours?) My Dr didn’t set a time frame but I am pretty sure the unspoken understanding was that this was meant to be a 15 minute thing once or twice a day. So maybe if I do end up going ahead with it, I will wait until right before I go for an NST so that if anything wonky does happen, I will be there at the hospital. No need to read. My silly thoughts at end of pregnancy. I think people are starting to think that I am just being impatient about this last month of pregnancy. As excited as I am to meet little Levi, I can wait 3 more weeks if that’s what he needs. But my main motivation to get labor going in the next 1-2 weeks is I am worried that I will end up with another c section even if it is unneeded. I have no problem getting sectioned again if it’s what Levi and I need, but I just feel like we should be able to do this! And I feel like I’m losing my confidence in that. Also, I have literally nowhere else to inject my Heparin that isn’t a bruise already and it is getting very painful. My belly looks and feels like it has been kicked by a steel toed boot. My hips are also bruised and I have a particularly awful bruise on my leg. I am also allergic to something in the Heparin and I have itchy spots everywhere I inject. My injection sites have also been bleeding for sometimes over 8 hours after I take my shot. It is not pretty. I miss Lovenox. Lovenox hurts more during the injection itself for me but the after effects are very minimal. Also, driving over 3 hours round trip twice a week to get monitored for 20 minutes and sent home even when Levi doesn’t quite pass (he has had several times that he just didn’t accelerate enough but the Dr still sent us home with no extra monitoring leaving me wondering why I even went) is wearing me out. As far as physically being in pain and tired, that I can handle. I will miss being pregnant as far as the kicks and that sweet time where baby is always with me wherever I go… I really will miss that part. I am so conflicted! Ok, you can read again. How big is the baby? Probably close to 7 pounds if he was really 6lbs 8oz last week as the ultrasound estimated. The Dr said she isn’t concerned about the difference between his head and belly percentiles at this point because A) he is almost ready to be born and B) she thinks he has done well following his growth curve and C) his head is engaged so it really may be bigger than it measured. Total weight gain/loss? I’ve had bad water retention issues again this week. I went up 9 pounds in less that 48 hours and lost most of it quickly but I have had a hard time with that now and then when I walk a lot. A trip to the mall sent me over the edge this time. But yesterday at my appointment I had gained just 2 pounds in 2 weeks so I guess I am probably up 31-ish pounds. Maybe more. Sleep? As I mentioned before, contractions waking me up have been a bit of an issue until last night. But honestly, I feel like I am sleeping really well for this point of pregnancy. Symptoms? I saw my Chiropractor this week and he said my pelvis was out pretty bad on the right (which I knew already from the pain). He got it back to normal and said to come see him every week until Levi is born so we can hopefully keep the pelvis aligned for an easier birth. He also offered to try inducing my labor with acupuncture after 38 weeks. I probably will take him up on that. The OB said it couldn’t hurt but she doubted it would work. But hey, if it can’t hurt, why not? So my inner thigh pain is slightly better. Since baby has dropped, a lot of my symptoms have lessened. I actually feel pretty good. Heavy and slow but good. Food cravings? Still on my greens and salads and I really want candy/sweets. Labor signs? Apparently not although my body has switched to clean out mode if you know what I mean. Gross. What I’m looking forward to? Baby sprinkle if we are able to have it, weather permitting. Milestones? Less than a week until I am the most pregnant I have ever been. Bump? We had some maternity pictures done last weekend. I haven’t seen them yet but I am excited to see how they turned out. I feel like I look really weird. I’m not sure what is going on with my face. It’s just that end of pregnancy look I guess. Dear God, I ask Your blessings and protection over the last bit of this pregnancy and birth. Thank You for how far You have brought us to this point. Thank You for this sweet baby and for his sweet kicks and movements and for this last bit of time that I get to have with him just me and him. In Jesus’ name, amen. Everything was chugging along. 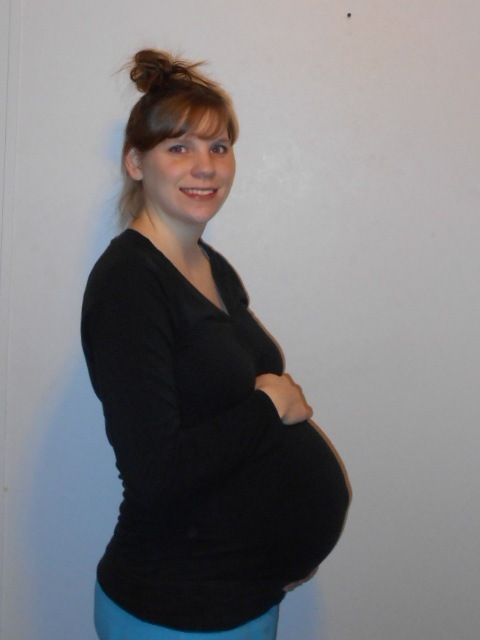 I was having several days of great morning sickness and starting to feel an iota of confidence. I was happily counting down the days until my ultrasound appointment (five) and feeling like I was actually doing really well with pregnancy the second time around. Not feeling too negative or anxious. Not wishing the days away. Just enjoying every day as I truly have learned that there is no “safe” point in pregnancy. On the day Tru was born, he was in distress. There really is no 100% safe time in pregnancy – or in life in general really. Anyways, all that confidence and good feelings left yesterday and I am feeling powerless to get back to that good place. Yesterday I did not feel pregnant. At all really. My morning sickness was gone! Gone was all the gagging and churning and having to sit down to get through a tough spot of nausea. I absolutely cannot stand how pregnancy symptoms come and go. I know that they come and go. I know that it is ok. But when they go, you don’t know when or if they are coming back. And if you have morning sickness and then it goes away and doesn’t come back….. It can be a very not good thing. This is the hardest point in pregnancy though. The point where you can’t use a doppler, haven’t had ultrasound proof of a baby, can’t go to triage and get an NST if you are worried, can’t do kick counts. The health of the baby is totally out of my control right now. I have to trust God to take care of everything in there. God, please watch over this little baby and sustain it’s life according to Your will. In Jesus’ name, amen. I have to trust that everything is alright even though I don’t always feel that way.